Looking out the window this afternoon brought the pleasant reminder that this upcoming weekend presents one of the Bent's favorite opportunities to go back in time. The unmistakable lines, the perfect pace, the gentle roll of the bow wake, and the gorgeous glow of pampered bright work - not unlike this Lake Union Dreamboat, photographed on a Bent cruise through BC's Gulf Islands. I pinched myself. I wasn't dreaming. 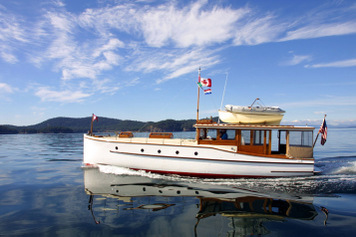 A pre-war wooden motor yacht was making it wondrous way down Elliot Bay for Bell Harbor and the annual Rendezvous of the Classic Yacht Associations Pacific NW Fleet, one of several such events scheduled for this summer. Saturday and Sunday, June 16-17, the harbor will be a solid slip to slip dreamland of lovingly restored and maintained wooden motor yachts, displayed up-close and touchable, many open for boarding, and all worthy of the awe and admiration they inspire. If you're anywhere near the downtown waterfront, make your way to Pier 66, check out the classic cars on display up top, then make your way down the gang-plank to a rendezvous with boating's past, and thank the skippers for keeping it present. Our naval architect used to own one of those classic beauties and we toured her and others at the rendevous. They are amazing. I remember vividly. when visiting you last year, the convoy of classic wood and the refreshing Pacific Northwest attitude onboard each vessel. Remember the boeing yacht? The harborside boat show was spectacular, but my favorite memeory was watching these elegant ladies navigate the locks... and sharing that locked water with the largest tugboat I've ever seen. I seem to recall a great many geraniums growing on after decks and in salons. It is June in Seattle. The lovely woodies have back out. Life is good. Sounds like a scene straight out of Hemmingway.